The spark plug replacement interval should be 20,000 mile for standard plugs over twice that for Iridium plugs. 2012+ 650s come stock with Iridium plugs. The spec for the rear sprocket nuts is 43.5lb-ft or 60Nm. I disagree with it. People have stripped nuts and broken studs using it. The generic chart for 10mm hardened bolts says 36lb-ft or 50Nm. Rich Desmond of Sonic Springs uses 30lb-ft or 40Nm with no problems. The spec on the front sprocket nut on the Vee is 83lb-ft or 115Nm. That seems fine. The spec on the exact same nut on the DL650 is 105lb-ft or 145Nm, which is way high. In the same vein, the spec on the 8mm bolts that connect the engine mount hanger to the frame is 16.5lb-ft or 23Nm on the Vee which is a good value. The spec on the same bolts on the 650 is 25.5lb-ft or 35Nm, which has broken bolts and stripped frame threads. Stainless steel nuts on SS engine mounts, the SS swingarm pivot and the SS rear axle have a tendency to gall. Use anti seize on the threads to prevent problems and reduce the torque to 80% of the spec to account for the lubrication effect. For example the 72.5lb-ft or 100Nm spec'd for the rear axle nut becomes 58lb-ft or 80Nm. 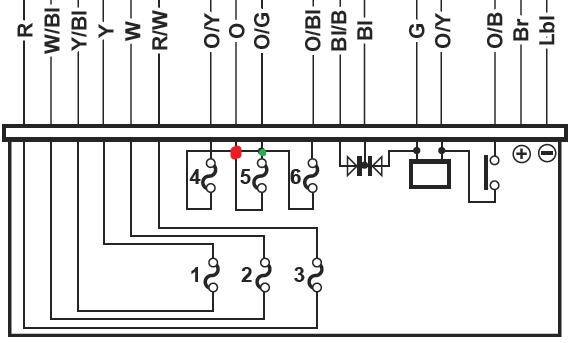 There is a misplaced connection dot in the fuse box of wiring diagrams I've seen for K4 and K5 DL1000s. The K3 was okay. I've put a green dot where the connection appears in the manual. That spot should be a crossover. The connection should be where I've added a red dot. (on the left for the colorblind). The common wire feed to those fuses should be the orange wire. The 2012 and later DL650 wiring diagram at the tail light connector is wrong. It should show W/B-W/B and Br-Gr. In the DL650 service manual the following error occurs. You see the problem? The US measures are over twice the metric measures. Which are good numbers for quarts instead of ounces. Just a tad under 2 us qts for both models will do it. Oil capacity numbers also can be a little strange. For example, the Glee takes 100ml more without a filter, due to the heat exchanger behind the filter, than the Wee's 2300ml. However, it only takes 50ml more than the Wee's 2700ml including filter even though the filters are the same. The kicker is both are listed as 2.9qts with the filter. I just get close by measurement and top off using the glass. On the DL650 the '07 and up addendum's periodic maintenance chart on page 13-11, the I for inspect for valve clearance is in the 11,000 mile column. Notice the spacing of the marks in the boxes are not uniform. The 11k box has both a dash indicating skip and an I indicating inspect while there is no mark in the 14.5k box. The interval is still 14.5k miles. The spacings on some other lines is also not uniform but the valve check is the only one so bad it changes boxes. All the service manuals say the regulated voltage should be 14.0-15.5V. 13.4V-14.8V is a better range. The 2008 and later DL650s, including the 2012 and later models, have 400W charging systems, not 375W. The 2012 and probably later 650 wiring diagram crosses colors at the tail light connector. It should read W/B goes to W/B for the brake light, B/W goes to B/W for ground and brown goes to gray for tail and license light..
nster, senoje, brutalguyracing and 1 others like this. Last edited by greywolf; 05-07-2016 at 05:59 PM. Greywolf, thank you very much for starting this thread. It's an excellent idea, and has great potential. Perhaps, overlapping with "official errors" being pointed out, it might be useful if contributors added in some handy "wrinkles" to make maintenance easier (wrinkles that are small, or don't quite fit into the general maintenance threads on the forum here). As an example of that : you have mentioned that it is distinctly easier to re-fit the Wee's rear axle from the right [unlike the factory standard fitment ~ from the left]. But, since I am not really adding anything particularly useful to this thread here, please delete this post after a day or two, in order to keep the thread "clean". I'll be updating my manual with RED pen and print this tread just in case. .As an example of that : you have mentioned that it is distinctly easier to re-fit the Wee's rear axle from the right [unlike the factory standard fitment ~ from the left]. Although some might like it, I didn't... specifically pushing with my left hand to tighten. Don't find it any more difficult to get the axle through left to right. Last edited by ozart; 05-07-2013 at 01:42 AM. Initially, when removing the rear wheel to change the tyre, I would remove & replace the axle from the left [as fitted at factory, and per manual's diagram]. Always found it a hassle at reassembly to juggle together the wheel, sprocket, axle spacers and the brake component. Seemed to need three hands to get it all lined up & fitting correctly as I slid the axle through from the left. Checking it at the end . . . well, half the time I found that my powerful wiggling had dislodged the brake torque arm from the boss on the swing arm. So, back to the start line again. Damnation. Then, REVELATION ~ following Greywolf's suggestion to fit the axle from the right side, it all became much easier. No need for three hands. No problem re-slotting the brake torque arm and keeping it in place [indeed, often I don't even remove it ~ just leave it in place, supported by a stub of not-quite-fully-withdrawn axle]. This whole from-the-right axle business is only a minor "wrinkle" (though saving me many wrinkles on the forehead). And yes, it is only a rather small example of some "misleading factory advice", in a manner of speaking. Yet you will note that there have been reports of Stromtroopers refitting the wheel/axle assembly, and then going for a ride and coming to grief at the first occasion of using the rear brake . . . because they had not observed that the brake torque arm had not re-seated correctly. And that is a safety problem which is not easy to identify at a quick & unsuspicious inspection after the refitting is [apparently] complete. Old Time Rider likes this. Thanks GW. Greatly needed for all. BTW, I'm looking to purchase a service manual for my new 2012 DL650 Strom. Anyone know of the best book to buy? The Suzuki factory service manual is the only one available for the 2012. Thanks Midnullarbor, for clarifying, in case someone didn't understand. If people are doing improper installations and actually riding, yes that's a safety concern. Hopefully they never do it again, or let someone else do it. The 1st couple times installing the rear axle, alignment through the right side bits were quite fiddly. The last couple dozen times haven't been any problem. Guess I've been lucky so far and not had to start over. I put it through right to left a couple times, which is easier, and probably saved 10 seconds. This positions the nut on the left. I'm right handed and prefer the nut on the right, where I can pull to tighten and generally have more power and control over the loosening/tightening process. I found it awkward using my left hand working the nut, especially pushing to tighten. Just stating my preference and why. If right to left is prefered, that's fine too. It appears that there is not much to be said for editing/correcting on this manual. I've found the same issue with my Nissan Titan's DVD manual. Some of it is problems related to translation. Some of it....well, I just don't know why the mistakes are so far off. Thanks for taking so much time to point out all these issues, Pat.